Things are hopping at the Sea Hag Marina. So far the scallop season has been a great success. 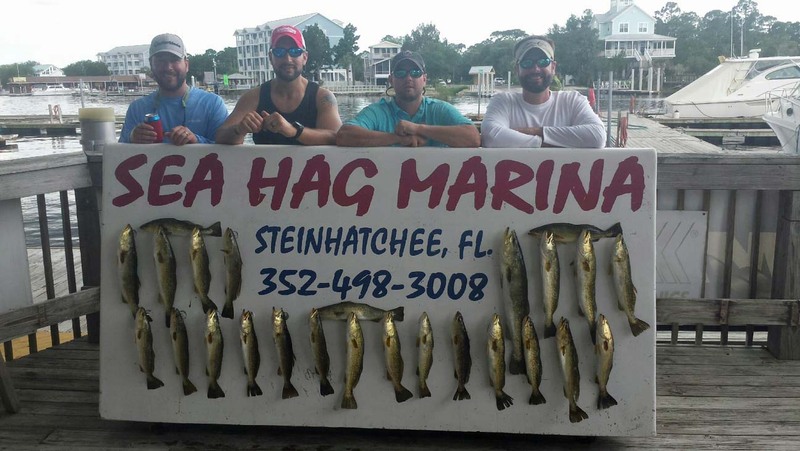 Initially much of the water south of the river was dark, making scalloping a challenge, but within the past few weeks the waters have cleared to the south, especially from Rocky Creek south toward Tater Island. One unusual aspect to this year’s scallop crop is that some of the meats are huge, larger than nickels, and occasionally up to quarter size; usually this early in the season the meats are dime-sized. This means that you should plan on not cleaning the scallops before you come off the water, because the individual limit of 2 gallons per person in the shell will turn out to be much more meat than the I pint per person of meats, and the same with the per vessel limit of 10 gallons. 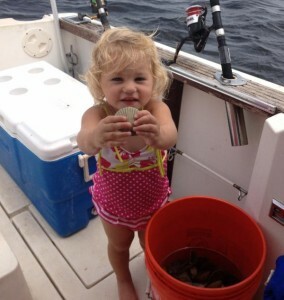 While some years the scallops are found in relatively deep water up to six feet, limits of scallops have been taken in 2 to 3 feet of water, making it easier for small children to participate. The hot spots late in the month have been near Piney Point to the north (the next point north of Big Grass Island) and just south of Rocky Creek to the south. Remember that the Sea Hag Ship’s Store has goggles, fins, dive flags, and fishing licenses, along with very well-equipped rental boats; everything you need for a successful scallop trip is right there in one place. 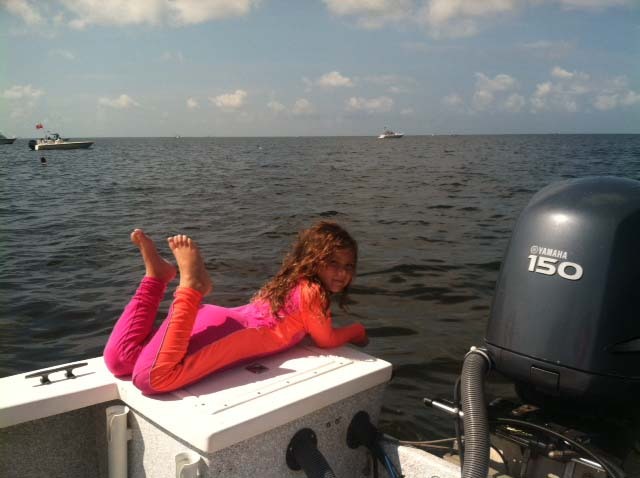 We have a fleet of 20 rental boats that are an excellent bargain. Just give us a call to reserve your boat in advance. 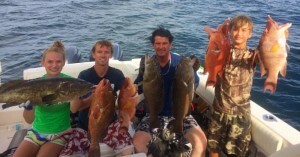 Offshore fishing has been excellent, with the opening of gag grouper season. 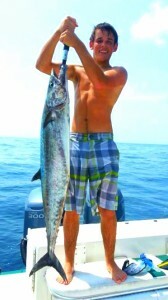 Both gag and red grouper, as well as some excellent kingfish and cobia, have been found on offshore structures. 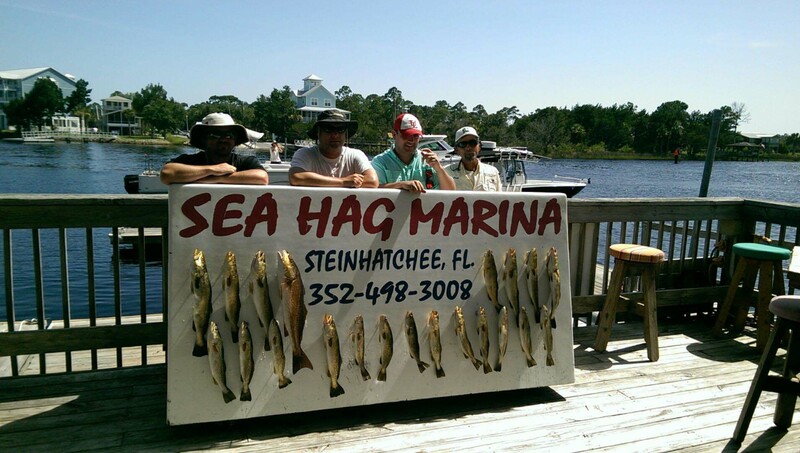 Inshore, floating grass has been a real obstacle and of course finding areas that are out of the scalloping traffic lanes is essential. 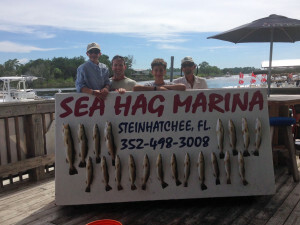 Many people have been fishing to the south since much of the better scalloping water has been to the north. 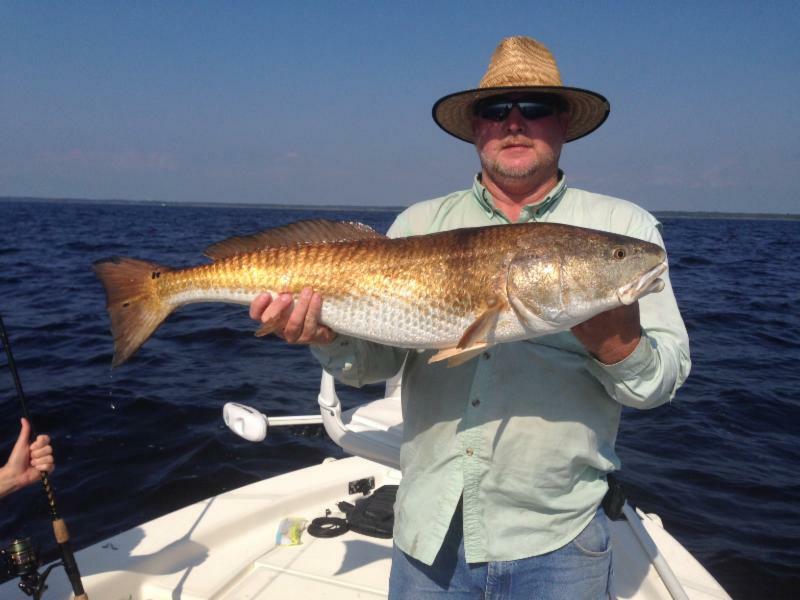 Areas around Hardy Point to Rocky Creek have provided some scattered redfish and the occasional trout; however, most of the trout have moved offshore with water temps in the mid-80’s and up. I’ve had reports of trout being taken in up to 20 feet of water. Here are some pictures of this month’s catches. Doug Barrett found this nice gator trout in a foot and a half of water. 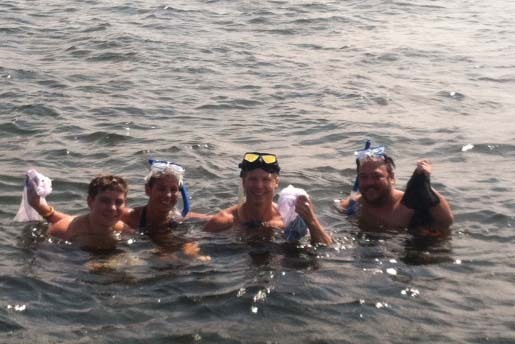 The Stewarts from Ormond Beach had a great time scalloping. Shel Motes landed this beautiful 25 pound kingfish. 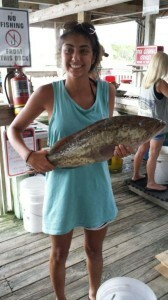 Cindy Klimek from Merritt Island found this scallop limit near the beginning of the month. 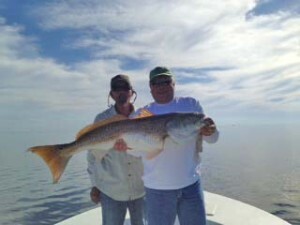 David Holt nailed this overslot 36 inch redfish. 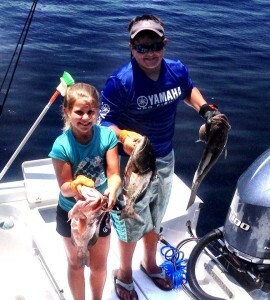 Jackson and Anna Swisher showed me some grouper before heading back out for scallops. 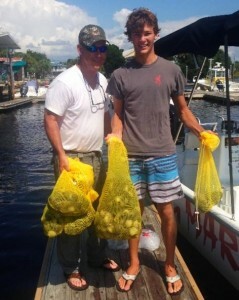 Mike Lumley from Tennessee and his grandson, Alex Blaquiere with several scallop limits taken on a Sea Hag rental boat. 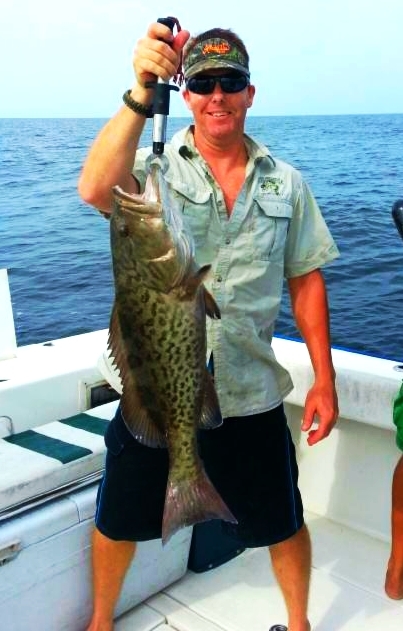 Paul Champion from Interlachen with a tasty gag grouper. In case you don’t know, spearfishing can be very productive in our waters. The Norwood clan plus Derek Snyder found these hog snappers and grouper in 60 feet. 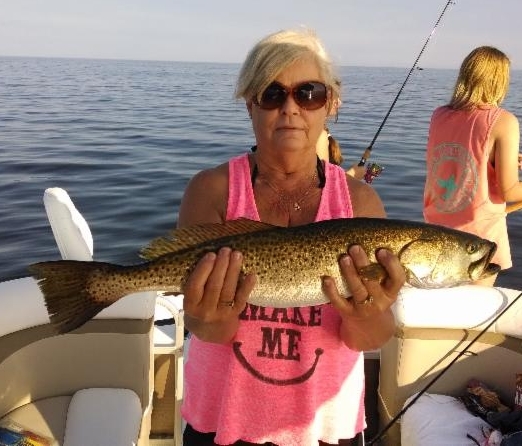 Carolyn Cadle with a fine trout pulled from the flats. Cheyenne Cooper wants to share her scallops with you. 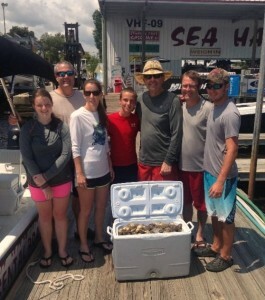 The Chuck Rice family from Valdosta with their boat limit of scallops. 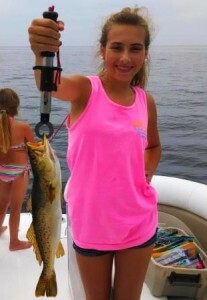 Ashlyn Purvis caught her first fish, this very nice trout, on the flats. 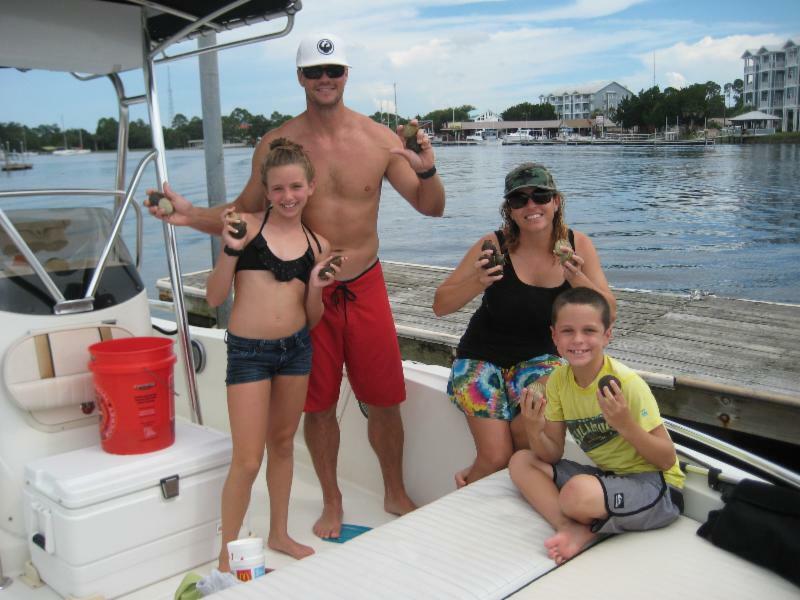 Brittany Baird, Blake Hedgecock and Missie Schnieder found some great scallop limits. 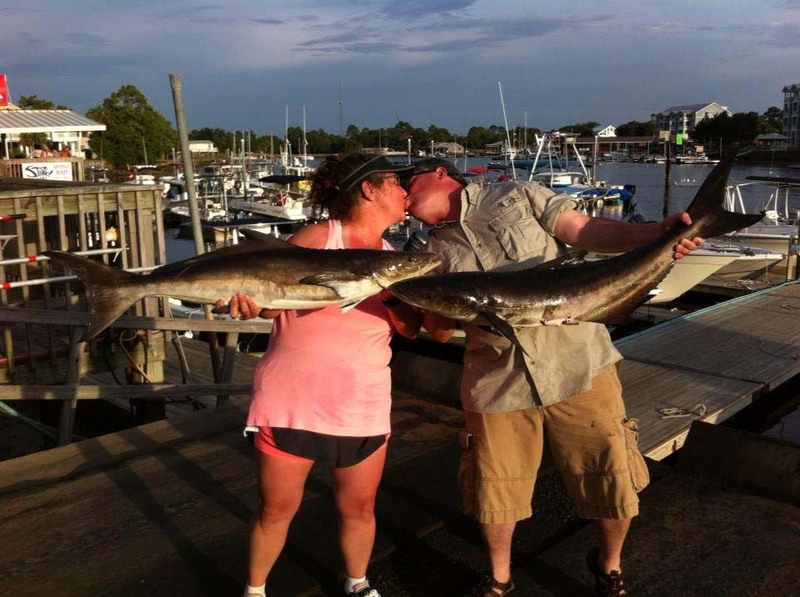 Clearly on an especially romantic fishing trip, Avi and Dorina Adler found this nice pair of cobia. 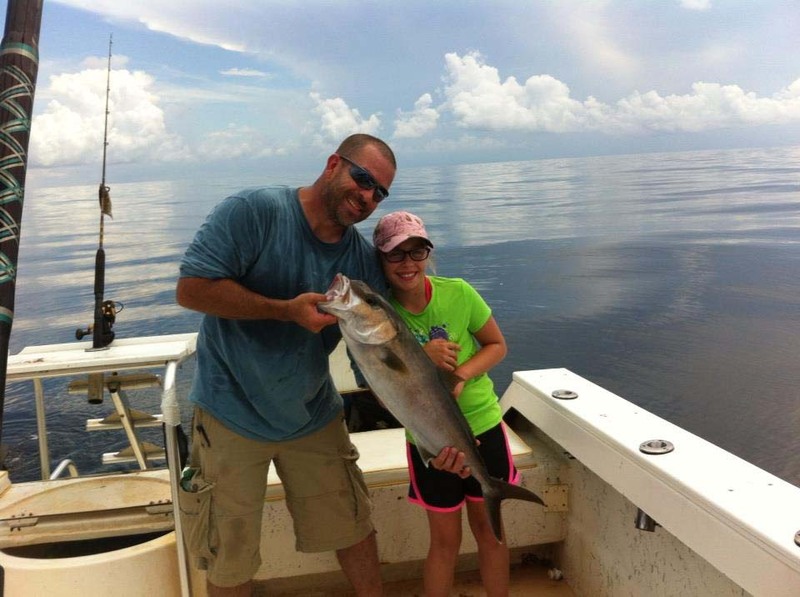 Offshore, amberjack season will open. The grouper bite has been very good and we expect it to continue, although fish could be moving slightly further offshore. Bottom fishing with frozen sardines or squid will still produce consistent fish, but you may need to move around areas of live bottom and structure. 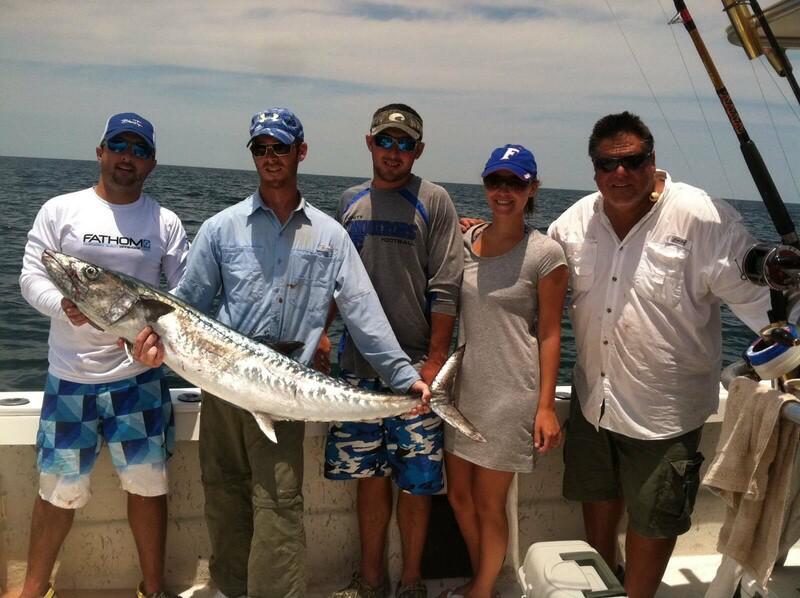 Fish bait pods nearshore for bluefish, Spanish mackerel and even the occasional kingfish. Since trout have moved to deeper water, it’s worth moving out to give them a try. Fish around some of the offshore bars, like 9 Mile and Little Bank, and areas around all the marked Bird Rack areas to the north. Sand trout are often found in the same areas. Regardless of depth, look for areas that have mixed sand and grass, and fish jigs with Gulp! tails along the bottom. 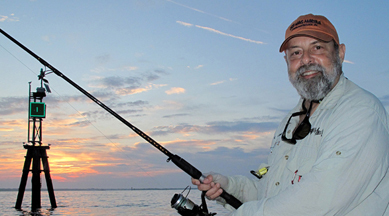 For more consistent action, throw out a chum block and wait for the baitfish to show up, along with bluefish, Spanish mackerel, and the possible cobia. Look for sharks as well. You will find something to bend your rod. Scallops are holding up nicely and with continued water clearing, more areas will be available for the fleet. We just need to avoid consistent heavy rains and the season will continue to be a great success. 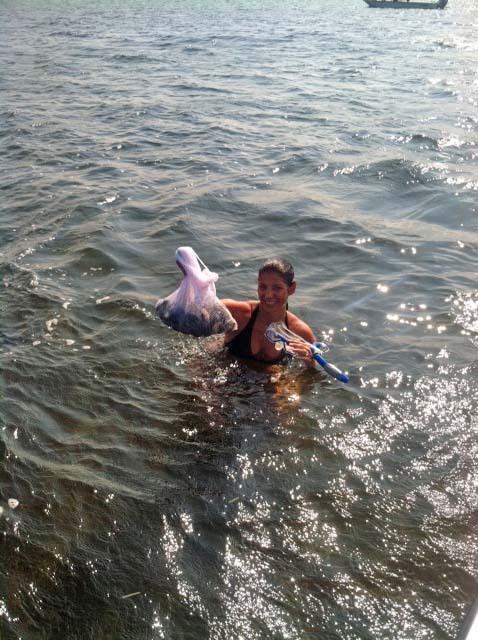 Scallop season is in full swing and our worries in late June (that the scallopers were gonna show and the scallops might not) were just that … worries. The harvest is very good and the size of the scallops this year is exceptional. We have been gathering limits in record time. 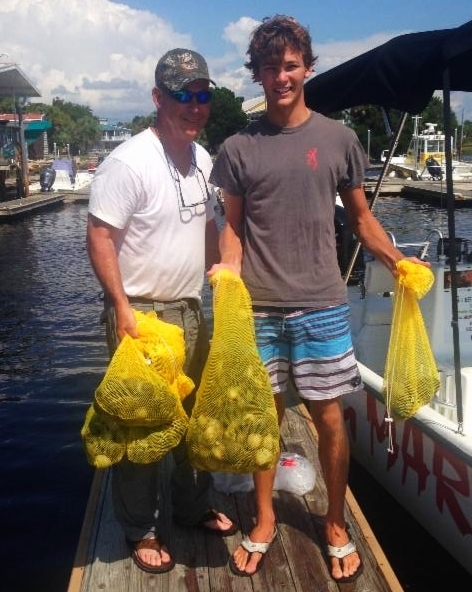 Tough for a family or group of friends to have a more enjoyable time on the water, not to mention that our sweet bay scallops, from our pristine waters, are one of the South’s culinary delights. We are offering half and full day scallop trips. Please give us a call and get in on this exciting time in Steinhatchee. 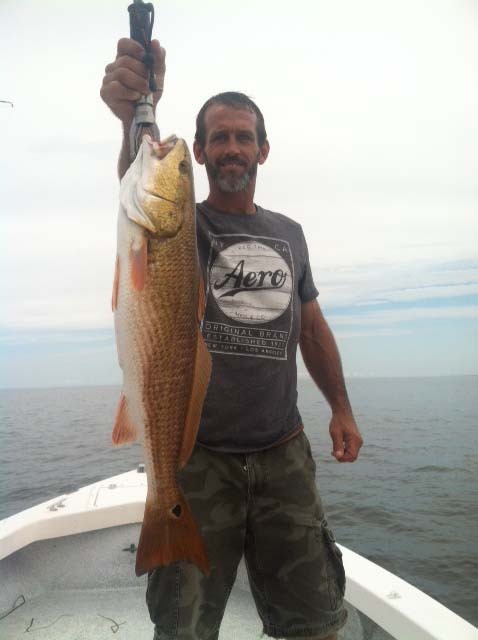 Don’t forget that while scalloping is our focus this time of year there are plenty of hungry fish out there like this beautiful red we caught just beyond the river. Early departures before the scallopers show work best. Come see us! The water is clear in most areas north of the river and the scallops are on the flats. They can be found in a few places south of the river also but the water is not as clear. If you work at it limits are to be found. As long as we don’t get a tropical system the water should continue to get clearer. 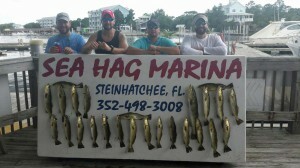 While the shallows are getting warmer there are still lots of trout to be caught. 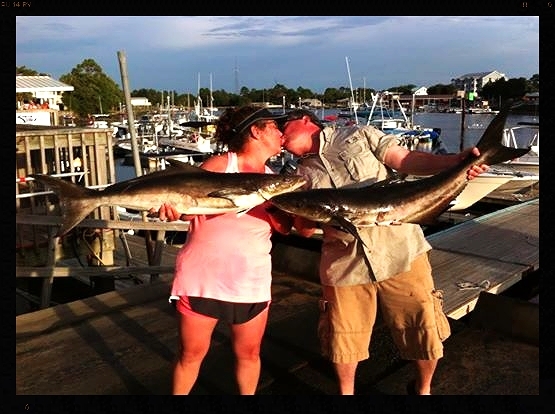 You may have to fish a little deeper to find them but limits are being brought to the dock. Redfish are not as active but can still be found around shallow structure and schools of baitfish. A few sand trout are starting to show up in the deeper holes and still plenty of Spanish around the sand bars. Until the season closes I am offering a special price of $250 for weekday scallop charters, so give me a call. The word August must originate from some ancient language meaning ‘time when skin leaks water’. It is one of the few times I wish I had an inside job in a pleasant thermally controlled environment, full time on demand, looking out a window at those outside and think, “Dude, you’ve got to be hot”. Actually, I’d rather be fishing in the heat than boxed in an air-conditioned office building. However, being prepared for the heat makes for a more enjoyable day on the water. Briefly, dress appropriately. Take advantage of shade. Wear a wide brimmed straw hat. Ice down an excess of bottled water and drink it all day long. Frequently, wet yourself with chilled freshwater whether using a towel or direct dump over the head. Water guns make the process a fun sport for everybody. Evaporative cooling is wonderful. To up the level of evaporative cooling, bring a squirt bottle mixed with 75% chilled water and 25% scented isopropyl alcohol. The alcohol not only accelerates cooling, but the mix can be used to clean sunglasses and small cuts one commonly gets on your hands while fishing. 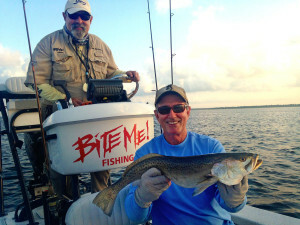 Generally, the best bite is early or late in the day, regardless of what you’re fishing for. Mid-day can be the toughest time to fish, especially when conditions are slick calm. I believe slick calm conditions make fish go to ‘sleep’. A chop on the water is a good thing regardless if you’re fishing inshore or offshore. You can pre-order at www.syppublishing.com or purchase from Amazon.com, www.syppublishing.com, BarnesandNoble.com and other online retailers, as well as some local stores. My first book signing will be at the Decatur Book Festival, Georgia, August 30-31, 5pm on Saturday, noon on Sunday. Hope to see you there!